Also see our article on the vibrant Jewish Catskills today and while you’re at it, check out our latest articles. Keeping kosher gives you the added ability to make a meaningful choice every time you put food into your mouth. Instead of just ingesting anything, not only do you have to make sure you’re eating physically healthy food, but a Jew also has to make sure they are eating spiritually healthy food. Rather just choosing this restaurant or that based on preference, the categorization of kosher vs. non-kosher means the choice now becomes one based on meaning. With that being said, going away on vacation often presents fun challenges for finding good food. While you can bring along everything, on vacation, you don’t necessarily want to be dragging along pots and pans and spending your time cooking. Kosher hotel options are somewhat limited. There are some exceedingly fancy (and exceedingly expensive) hotel options on Pesach [Passover] all over the country, in places like Arizona, Florida, the Bahamas, Cancun, and the list goes on. For a ‘regular’ day, there is a much sparser list of kosher hotel options – that is, places where they feed you three proper, and sometimes warm, meals a day. The Raleigh Hotel in South Fallsburg, NY is an interesting place. For a long time, it was a “kosher style” hotel catering to traditional, but not-really-observant Jews who vacationed in the Catskills. The author was actually there, before being a Torah observant Jew, at a family reunion. The place was mostly empty in those days (circa 1990s) though it held well maintained tennis courts, bocce ball courts, and a fancy lobby and pools. It has since been bought by the Bobov Chassidim and, at least when the author returned as a Torah observant Jew looking for a kosher hotel for a short vacation, it was PACKED. The hotel is slowly undergoing renovations (it’s huge). 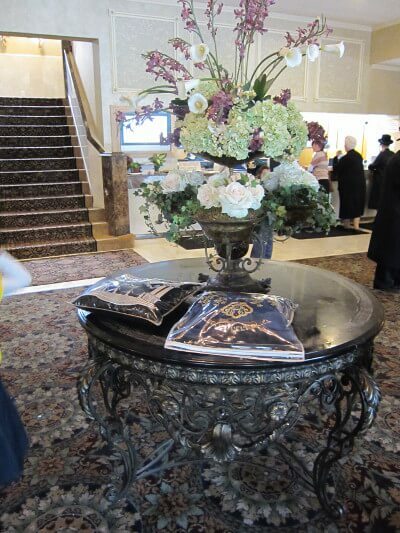 A picture from the lobby is above – the lobby hasn’t changed from it’s “kosher style” days (it’s also huge, like the hotel), but now you see tallis bags, and things of this nature on the tables. The central staircase is to the back, with the check-in counter to the right. Above is a close-up of the reception desk, much the same as it was, except those are Chassidish women behind the counter. As an estimate, about 85% of the guests were Chassidish, with the remaining 15% being of the Yeshivish variety, and less than 1% being in the Modern category (these distinctions to be described in another article). As an observant Jew, it’s very comforting to walk around and see everyone dressed appropriately and sharing your values, though there are vast, vast cultural differences between the Chassidim, whose primary language is Yiddish and who are generally (with very large exceptions) more centered around their own communities. 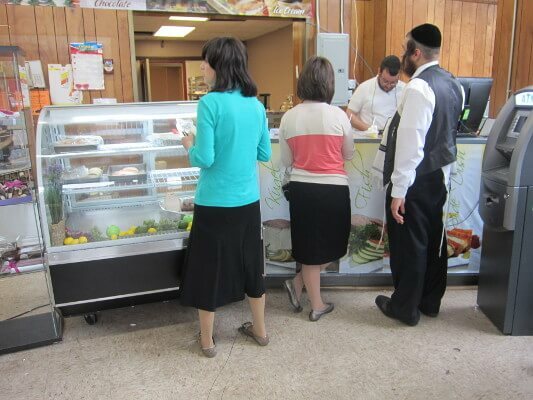 Here’s the store just outside the lobby filled with kosher foods, newspapers, magazines, and so forth. Everyone is, again, dressed modestly in what is a very relaxed environment. The food is plentiful wherever you go . . .
. . . and here’s some of the food. 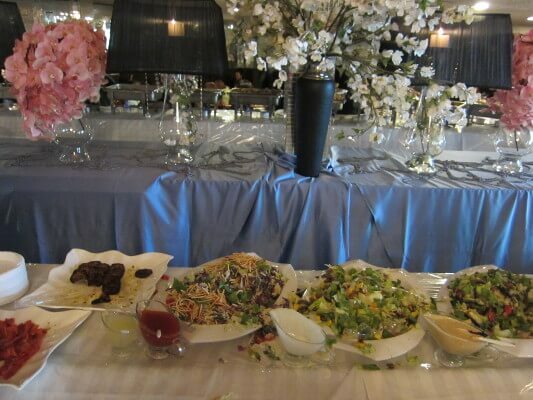 This was the buffet before Shabbos, which was followed by lots more food throughout Shabbos, and then more food after that. It was decent, but does require a hardier stomach for digestion than our home cooked food. 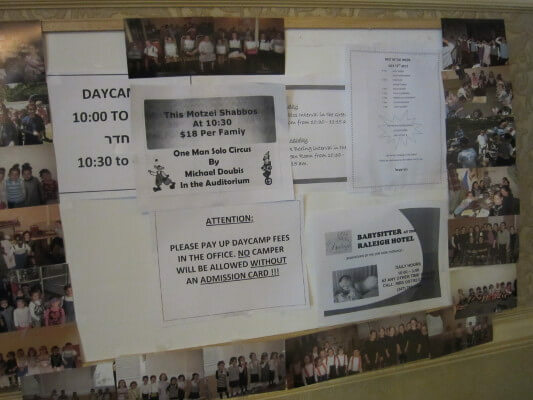 Above is the summer camp bulletin board. Many families actually life at the hotel all summer. In fact, there was a separate wing of the hotel dedicated for those who lived there for long periods of time. Rumor is that on the expansive grounds on which the hotel sits, they are planning on replacing the baseball fields with bungalows. The outside grounds haven’t been kept up the same way. 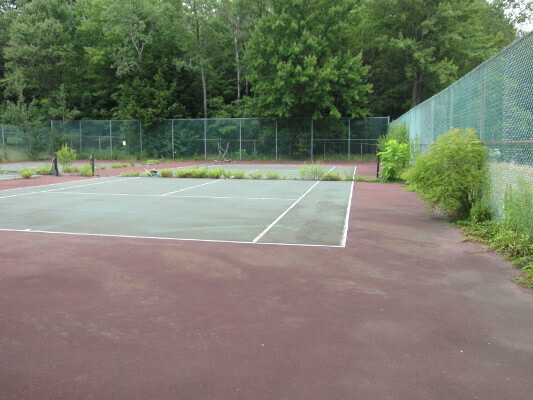 The tennis courts, it seems, don’t get the amount of use that they used to. The hotel actually went through about two years of being closed, so some things got into a bit of a state of disrepair, but the inside of the hotel was clean and in good repair. Rumor has it, they refurbished the hotel rooms. Here’s the interior of one of those rooms. Note there are at least three additional roll-in cots in this room. Many observant Jews invest lots of energy into their families and make family a priority, and the families tend to be larger. If you have something that you believe in which is worthwhile passing down to the next generation, you tend to have more children to pass those strong beliefs down to. 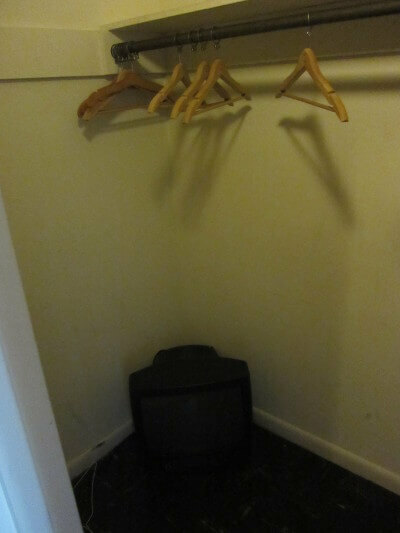 It seems the Raleigh hotel does actually have TV’s. A great many (most?) Torah observant jewish households don’t have televisions as it’s largely filled with all sorts of scantily clad women, and for lack of a better word, “narishkeit”. 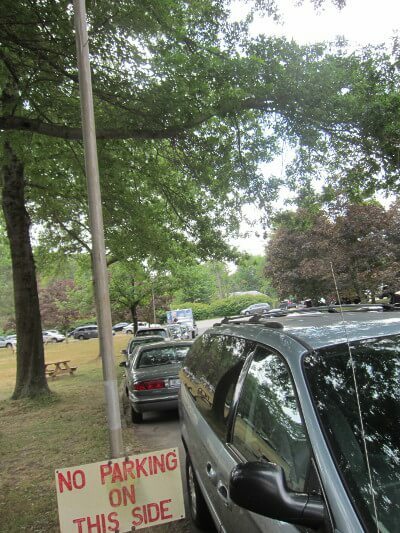 This one, a CRT no less, was hidden away in our closet.
. . . and finally, here’s the “parking lot” outside. Gone is the large lot with nicely painted lines. That lot fell into disrepair, but the lanes near the hotel with the “No Parking” signs are now lined with cars parked in all directions. I’m not quite sure why, if it’s now okay to park in these lanes, the “No Parking” signs weren’t just removed, but it adds to the humor, I suppose. Does anyone know of any places like the “old” Raleigh, Browns or Kutcher’s? I am longing for one of “those” weekends one more time. Oh, the food…. Hi Marlene – sometimes there are kosher weekend programs run at various hotels. There are also organizations like https://www.gatewaysonline.org/retreats/holiday-retreats/ which have things on Jewish and other holidays. You can still actually go to the Raleigh. These are all kosher programs with Shomer Shabbos guests with the exception of Gateways which is usually a mixed religious / non-religious crowd. Maybe try that one, but I have to warn you – while the food is just as plentiful, it’s of a whole lot better quality than the “old” places. I have fond memories as a boy in the late 50’s and early 60’s of the Raleigh Hotel. I went with my parents for the Passover holidays (may they both rest in peace), and have pictures taken with them in little plastic fobs on key chains that you hold up to your eye. I miss this way of life very much, a simpler time for sure. I recently stayed at the Raleigh. In spite of claims that the hotel has been renovated, many of the guest rooms are circa 1965. 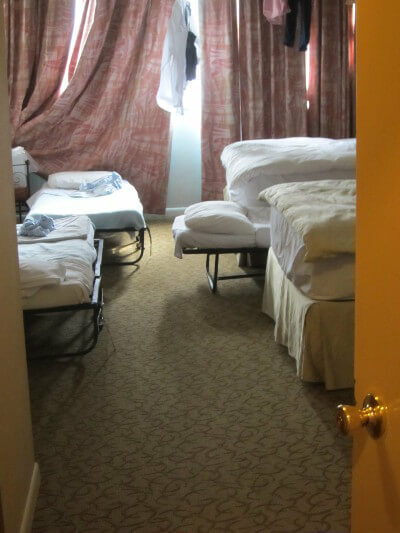 However, they are very spacious and the housekeeping staff is excellent! The rooms were spotless. The dining rooms have been updated. The food is excellent with a focus on presentation as well. Primarily, it’s traditional Ashkenazi fare. The overall service was very accommodating, the wait staff was very friendly and the front desk staff extremely helpful. The extensive grounds have not been well maintained. If the hotel and grounds were truly renovated, it could rival any four star resort. The Raleigh was always kosher. Just because the people were mostly non-observant and it didn’t meet your particular standards doesn’t mean it wasn’t kosher. When I was there circa. 1996, I was -also- non-observant. It had nothing to do with not meeting my standards. I think it was “kosher style” though (not kosher, but not obvious traif products), not kosher but I’m willing to be corrected. I’ll have to look into it.